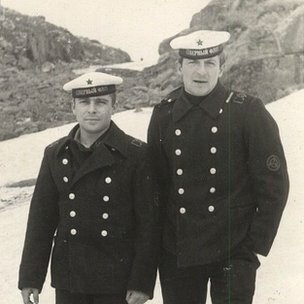 Vyacheslav Mazurenko, then 22, was serving as a chief warrant officer (CWO) on the vessel, which now lies abandoned in the Arctic’s Kara Sea. Today he lives in Ukraine and he told BBC Russian what happened. “We were on a five-day trip to check everything was working normally, before a 70-day round-the-world mission without resurfacing,” he said. The mission would be to collect data about Nato and other enemy bases. K-27 had two experimental liquid metal-cooled reactors – a design never tried before in the Soviet navy. 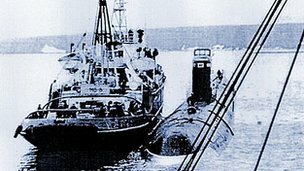 Nuclear power enabled the sub to stay underwater for weeks without resurfacing and without having to refuel. “At 11:35 everything was peaceful,” he said. “The bulkheads were open. I was in the fifth compartment, next to the fourth compartment with the two nuclear reactors, talking to some crew members there. We suddenly noticed some people running. They did not understand what had happened immediately because the radioactive gas had no odour or colour. But two hours later, some crewmen came out of the fourth compartment – and some of them had to be carried, because they could not walk, CWO Mazurenko said. As the sub approached, the base’s command fled the dockside, because special radiation alarms onshore were emitting a deafening roar, CWO Mazurenko recalled. Some have blamed K-27’s Capt Pavel Leonov over the accident, but CWO Mazurenko says the captain faced a life-or-death choice. The crew of 144 were poisoned – nine died of radiation sickness soon after the emergency, and the others were ill for years before their premature deaths. K-27 went into service in 1963, about five years after construction had started. It was very expensive and took longer to build than other Soviet nuclear submarines. So the sailors called it the “Little Golden Fish” – or “Zolotaya Rybka” in Russian – after a magical, fairy-tale fish which makes people’s wishes come true. 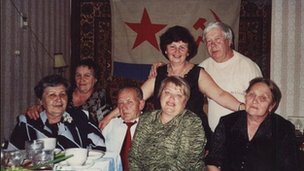 “In Soviet times, we were told that our subs were the best, and we had to be different from the ‘imperialists’. But the first subs were far from perfect. Soviet leader Nikita Khrushchev said: ‘We’ll catch up with you and overtake you’. They kept churning out new subs, regardless of the risk to people,” CWO Mazurenko said. The crew were part of the military elite. They got lemons and oranges – citrus fruit that most Soviet citizens, battling daily with shortages, never saw. Five days after the accident, the rest were taken to Leningrad – now called St Petersburg. They were each isolated from the outside world. 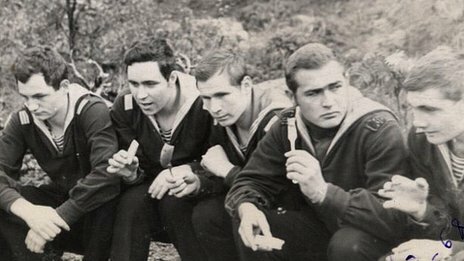 K-27 officers were later warned they should not have children for five years and were given regular check-ups, but there was no proper medical follow-up for the ordinary submariners, according to CWO Mazurenko. Many of them were declared “healthy” by military doctors, despite their illnesses, he added. In 1981, K-27 was sunk at a depth of just 30m (99ft) in the Kara Sea – far shallower than the depth required by international guidelines. This entry was posted in The world's submarines and tagged K-27, Russia on January 25, 2013 by jasonlockley.